The Steelers offensive superstars looked the part in Pittsburgh’s AFC Divisional Playoff match-up against the Jaguars at Heinz Field on Sunday afternoon. Quarterback Ben Roethlisberger threw for 469 yards and five touchdowns. Injured receiver Antonio Brown turned in a courageous effort, pulling in seven passes for 132 yards and two touchdowns. And running back Le’Veon Bell was the dual threat he’s been his entire career, tallying 155 total yards from scrimmage and two touchdowns–one through the air; and one on the ground. Yes, the Steelers high-paid offensive stars gave fans their money’s worth. Only problem was, they didn’t give them a victory, as the Steelers fell 45-42 to end their season one week before most thought it would, and three weeks before everyone wished it would. Why? Because, while the Steelers stars were dazzling their fans with perfect throws and breath-taking catches, the Jacksonville Jaguars were executing playoff football. Part of it is winning the turnover battle. Turnovers are a big deal during any football game–and they become absolutely vital after the calendar changes from December to January. While the Jaguars defense collected 33 takeaways during the regular season, to Pittsburgh’s 22, they also took seven of them back for scores, while Pittsburgh put up one giant zero in that department. Perhaps then it was no surprise that Jacksonville collected two turnovers on Sunday and turned both into touchdowns. The Steelers, meanwhile, couldn’t turn any takeaways into points, because their defense didn’t come up with a single one. Speaking of Pittsburgh’s defense, after leading the NFL in sacks with 56 during the regular season, it barely got a hand on Jaguars quarterback Blake Bortles. 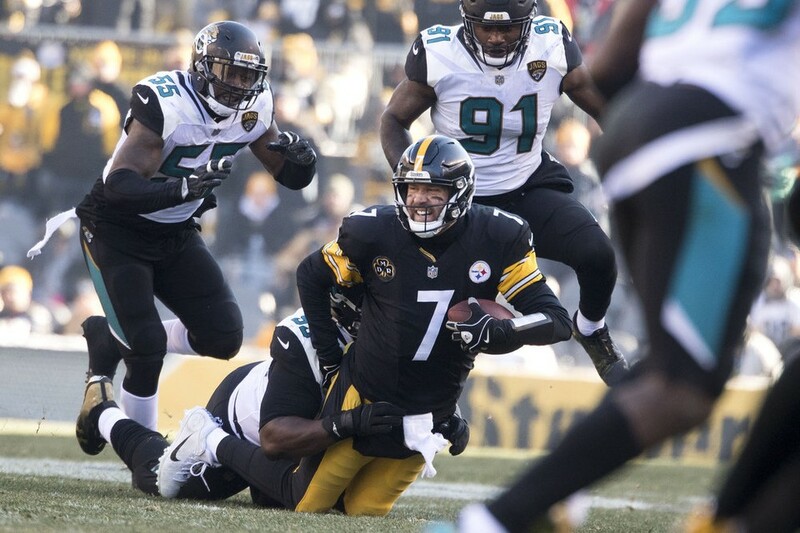 The Jaguars defense that collected 55 during the regular season didn’t exactly hound Roethlisberger, who was sacked just twice in 58 attempts. But one of those sacks was of the strip variety, and the fumble was taken to the house by linebacker Telvin Smith. What about third down conversions? The Steelers were seven for 16, which isn’t exactly horrible. Jacksonville, meanwhile, was eight of 14. This doesn’t seem like a huge disparity, that is, until you consider the Steelers were battling back from a 21-point deficit. When you have a team on the ropes, which the Steelers did after cutting their 28-7 deficit to 28-21 with back-to-back touchdowns to end the first half and begin the second, your defense needs to get off the field as quickly as possible in-order to give the football back to your red-hot offense. But not only were the Jaguars pretty efficient on converting third downs, they had no three-and-outs the entire afternoon. That’s right, ZERO three and outs for the Jacksonville Jaguars against the Steelers. Zip. The Steelers were four of six in that category, but the fact that they had to attempt so many is indicative of a team that was playing from behind the entire afternoon. Jacksonville had the lead right from the beginning. Because it converted on its only fourth down attempt of the day, when running back Leonard Fournette dived through the tackle attempt of Sean Spence and into the end zone for a one-yard touchdown on the game’s opening series. The Steelers two failed fourth down conversions came when the yard to gain was less than one. The Jaguars simply out-executed Pittsburgh in every important measurable that a head coach holds near and dear to his heart. Maybe that’s why they rushed 35 times, to Pittsburgh’s 18. Why pass 55 times, when you’re averaging 4.7 yards per carry on the ground? The Steelers out-gained the Jaguars 545 to 378, and in many ways, they were the more spectacular offense. But statistics are nice, winning is even nicer. The Jaguars did just about everything a team needs to do in-order to advance in the playoffs. And that’s why Jacksonville is packing for the AFC Championship game, and the Steelers are packing for the offseason. This entry was posted in Steelers 2017 season and tagged Antonio Brown, Ben Roethlisberger, Joe Haden, Le'Veon Bell, Pittsburgh Steelers, Sean Spence, Steelers vs. Jaguars. Bookmark the permalink.